For his first American film, Alfred Hitchcock teamed up with producer David O. Selznick (Gone With the Wind) to create a "spine-tingling" (LA Weekly) romantic thriller that won the Academy Award for Best Picture. Based on Daphne Du Maurier's timeless novel, this dark, atmospheric tale of fatal obsession features Laurence Olivier, Joan Fontaine and Judith Anderson, as well as a "haunting score by Franz Waxman" (Leonard Maltin). After a whirlwind romance, mysterious widower Maxim de Winter (Olivier) brings his shy, young bride (Fontaine) home to his imposing estate, Manderley. But the new Mrs. de Winter finds her married life dominated by the sinister, almost spectral influence of Maxim's late wife: the brilliant, ravishingly beautiful Rebecca, who, she suspects, still rules both Manderley and Maxim from beyond the grave! When one thinks of great film directors, few names come to mind before Alfred Hitchcock. A larger than life figure, his incredible cinematic achievements have helped to cement him as the undisputed "Master of Suspense," while his iconic public persona has made him an indelible fixture of popular culture. On the other end of the moviemaking spectrum, when one thinks of great film producers, few names come to mind before David O. Selznick. A workaholic who is known to have seldom slept, he helped realize several classic films throughout the 30s and 40s, including 'Gone with the Wind.' In 1940, both of these giants of cinema came together for 'Rebecca,' marking Hitchcock's first foray into Hollywood filmmaking. Of course, as is the case when any two titans join forces, there were some clashes on set, resulting in various creative conflicts. These disputes lend the picture a fairly unique spot within Hitchcock's legendary filmography. Despite the director's many trademark flourishes, Selznick's influence remains clear throughout, somewhat diluting the true "auteur" vision that permeates the filmmaker's other works. While the movie still holds up remarkably well, featuring many memorable and powerful cinematic moments (it's actually the only Hitchcock film to ever win Best Picture), it doesn't quite reach the same grand heights as some of the director's other accomplishments. Based on the novel of the same name by Daphne Du Maurier, the movie follows an unnamed female protagonist (Joan Fontaine) who falls in love with a wealthy widower, Maxim de Winter (Laurence Olivier). After marrying, the pair move into de Winter's lavish estate, Manderley, an opulent mansion littered with servants. Shy and unimposing, Fontaine's character has a hard time fitting into her new extravagant role. All the while, the memory of de Winter's deceased first wife, Rebecca, looms throughout the mansion's endless halls and corridors. As Rebecca's almost ghostly influence starts to chip away at the new Mrs. De Winter's sanity, shocking revelations are made about her supposed death, which may spell doom for the new lovers' happy life. A hallmark of gothic storytelling, the plot weaves a darkly romantic tale that gradually grows more ominous as the running time rolls on. The first half of the movie is actually rather light, presenting the sweet, idyllic courtship of the film's two central characters, introducing the audience to their relationship as it exists outside of Rebecca's gloomy influence. When the lovers arrive at Manderley, the tone immediately shifts and the narrative takes on a slow burning, suspenseful quality that methodically peels back the story's increasingly creepy layers. As the film's nameless heroine, Joan Fontaine becomes instantly likeable, lending the part a genuine air of sweet sincerity. A common girl thrust into the role of an aristocratic lady, Fontaine must steadily adjust to a lifestyle she is not naturally inclined for. 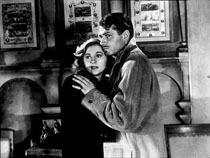 Fragile and out of place, for most of the movie, the mere mention of Rebecca's name is enough to overpower her. While the character might come across as overly meek to some, she eventually makes some important strides, demonstrating bursts of strength, which coupled with her innate kindness, make her a compelling and sympathetic protagonist. Playing opposite the shy, sweet woman is Laurence Olivier as the imposing Maxim de Winter. Charismatic and intimidating, Olivier's behavior as de Winter remains slightly ambiguous, until later plot revelations clarify his actions. 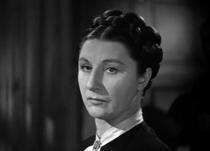 Also of note, is Judith Anderson who plays Mrs. Danvers, Manderley's housekeeper and Rebecca's former confidant. Spooky and menacing, she's responsible for a lot of the movie's more uneasy moments. 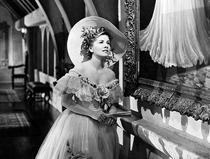 Though her name serves as the title of the film, the character of Rebecca never actually appears on screen, and yet her presence is heavily felt throughout the story, informing every twist and turn. Through references and little visual touches (including a particularly memorable scene where Mrs. Danvers goes through her old belongings), Hitchcock is able to craft a fully formed antagonist that has no physical body or voice. On that same note, Manderley itself becomes a central figure in the drama. The magnificent, gothic estate is vast and wide, but never inviting, bathed in murky shadows and looming specters of the past. Hitchcock films the house with a dreamy, ethereal aesthetic, full of flowing movements, POV shots, slow push-ins, and an impeccable sense of classical framing. While many filmmakers often take advantage of widescreen ratios to give their images horizontal range, here Hitchcock actually utilizes the vertical nature of the 1.33:1 picture to its fullest. Many shots feature immense space on top of the frame, giving the images a great sense of height that dwarfs the characters within Manderley's immense grandeur. All of these visual touches, coupled with the sets' incredible production design, make the mansion feel like a living, breathing character, ready to swallow up our heroine at any moment. As effective as the performances and visual style are, 'Rebecca' is not without some minor flaws. The pacing is a bit slow throughout, and while things pick up during Fontaine's unwinding in Manderley, they eventually slow down considerably in the movie's third act. A very important reveal is also handled in a rather unappealing manner, relying far too heavily on very long exposition. To his credit, Hitchcock tries to elevate the scene with some meaningful camera movements, but the sequence still feels static and drawn-out. After this revelation, Maxim is placed at the forefront of the story's forward progression, marginalizing Fontaine's presence. While Olivier does good work, after carrying the picture for so long, Fontaine's absence feels a little jarring and I came to miss her on screen counterpart, mousiness and all. 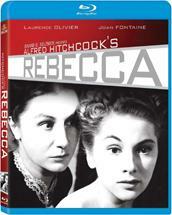 'Rebecca' is a creepy, gothic romance that features many of Hitchcock's trademark stylistic touches. Joan Fontaine and Laurence Olivier make for a compelling on screen pair, taking the audience on a dark, psychological journey through the shadowy halls of Manderley. A sometimes uneasy but ultimately successful union between two giants of cinema, the film features the collective strengths and weaknesses of Selznick and Hitchcock. Though a strong Hollywood debut for the British filmmaker, 'Rebecca' is a comparatively lesser effort from the famed "Master of Suspense." Of course, even a lesser effort from Hitchcock is still better than the majority of what the medium has to offer. MGM presents 'Rebecca' on a BD-50 disc housed in a keepcase. After some logos and warnings the disc transitions straight into the film, forgoing a traditional menu. The packaging indicates that the release is region A compatible. The movie is provided with a black and white 1080p/AVC MPEG-4 transfer in the 1.33:1 aspect ratio. With an authentic, filmic appearance and strong detail, the film looks absolutely lovely on Blu-ray. The source print is in good shape but there are some minor specks and vertical lines visible from time to time. Marginal contrast pulsing is also apparent periodically, but doesn't detract much from the experience. A moderate layer of grain is present throughout, adding a nice level of rich texture to the image. Clarity is often exquisite, revealing sharp fine details that show off every inch of the film's lavish sets and artful compositions. With that said, the second half of the movie does have a comparatively soft appearance. Whites are bright without overpowering the image and blacks are nice and deep, bathing the picture in bold, high contrast shadows. Some very subtle edge enhancement is visible in a few shots but is essentially negligible. Nicely preserved and free of any major digital tinkering, the video transfer is fantastic. Certain shots are a bit hazier than others, but by and large there is a great sense of detail and depth throughout, making this a great example of a classic film done right. The film is presented with a DTS-HD MA 2.0 mono track along with optional English SDH subtitles. With a nice, full-bodied quality, the modest audio comes through wonderfully. Dialogue is crisp and clean throughout, forgoing the usual thinness that plagues many classic titles. The movie's dramatic score carries strong fidelity but can strain slightly in the highest frequencies. Effects work is nicely balanced without overpowering the other elements. Crashing waves become an important auditory motif and bring some marginal low end activity. Thankfully, I did not detect any notable crackles, pops, or background hissing. With this technically strong and artistically faithful mono mix, 'Rebecca' sounds exactly like it should. While there are inherent limitations to any track this old, the audio presentation is quite strong considering its age. MGM has compiled a solid collection of supplements, including a commentary, featurettes, and archive interviews. All of the special features are presented in standard definition with Dolby Digital 2.0 audio and no subtitle options. Commentary with Film Critic Richard Schickel - Schickel provides a decent but mostly uneventful commentary. The critic seems very knowledgeable about the movie and offers various insights related to the film's themes, source material, casting, plot, characters, and the numerous conflicts that arose between Hitchcock and Selznick. In a break from the usual overly complimentary tone of most commentaries, Schickel even discusses some criticisms he has for the picture (many of which I agree with). Unfortunately, while the bits of production trivia are interesting, most of his analytical comments are rather basic and there are far too many lengthy pauses in the discussion. Still, big fans of the movie and Hitchcock might find some value here. Isolated Music and Effects Track - An isolated music and effects track is included in Dolby Digital 2.0 mono, which allows the viewer to watch the film sans dialogue, emphasizing the score and effects work. The Making of Rebecca (SD, 28 min) - This is an interesting look at the film's production that features various interviews with critics, professors, other directors, and relatives of the filmmakers. The main focus is placed on the friendly conflict that arose between Hitchcock and producer David O. Selznick during the shoot. Other topics touched upon include some background information on Hitchcock's path from England to Hollywood. The film's adaptation process and casting are also discussed along with various anecdotes about the shoot. Some archive interview material with the director is also provided, rounding out a pretty informative doc. The Gothic World of Daphne Du Maurier (SD, 19 min) - Here the focus is on the author of the movie's source material (who also wrote the novelette 'The Birds' was based on). The writer's recurring themes and gothic style are discussed in detail. Screen Tests (SD, 9 min) - Screen tests for the female lead are provided with Margaret Sullivan and Vivian Leigh (joined by Laurence Olivier). The tests can be viewed separately or together. This is a really welcomed inclusion and it's certainly interesting to see the two actresses' different takes on the character. While both are strong, I think Hitchcock definitely made the right decision with Fontaine. Radio Plays - Three radio play adaptations of the novel and movie are available to listen to in Dolby Digital 2.0 audio. The plays included are the original 1938 version starring Orson Welles (1 hr), a 1941 adaptation presented by Cecil B. Demille (59 min), and a 1950 version with Vivian Leigh and Laurence Olivier (1 hr). Perhaps even more amusing than the plays themselves, is getting to hear the announcer enthusiastically plug various old-timey products before they begin. Hitchcock Audio Interviews - Two audio interviews with the director are included. One is conducted by Peter Bogdanovitch (4 min) and the other is handled by Francois Truffaut (9 min). Both interviews are very interesting, with Hitchcock offering various insights on the movie's style, and what is was like working with Fontaine and Selznick. Original Theatrical Trailer (SD, 2 min) - The movie's theatrical trailer is included. Though not as artistically powerful and suspenseful as some of his other works, 'Rebecca' remains a strong effort from Alfred Hitchcock that fully deserves its classic status. As his Hollywood debut, the movie went on to pave the way for the director's later masterpieces and has the great distinction of being his only film to ever win Best Picture. The video and audio are both strong, with a respectful transfer and an authentic mix. Supplements are nice, offering lots of background information on the movie's production and the friendly conflict that arose between Hitchcock and Selznick. This disc should more than please any classic film fan and definitely gets my recommendation.